Living high on the hog was dirt cheap this year and here are my Top 9 Recipes of 2014 to prove it! While there were fewer recipes to choose from, my picks this year are still top shelf. (I took off the summer from posting food recipes, and instead posted a video series on my enlightening and entertaining Indian Summer Vacation.) And click on any recipe name to see what I'm talking about. To start with I made an earthy Vegetarian Mushroom Soup using crimini, white button and portabella mushrooms, that I purchashed from my local 99c only Store. I also bought pungent veggie broth and some cheap white wine to simmer the fungus in. I brought some to my workplace for my vegetarian friends and they raved about it. I've been making Old School Hash Browns for breakfast all year long. I like to pair them with 2 sunny side up eggs, so the warm yoke soaks and flavors the crisp and tender sauteed potatoes - it's a perfect combination. Some hash browns are chunky; I like mine grated with some added onion, and grilled until a hard crisp shell is formed, but the center is still moist. You definitely want to try my recipe out - it's so simple but so delicious. Probably some of my craziest recipes are from my Sushi Video Series. Yup, you read right, raw fish. Of course I couldn't have done it without being friends with my neighbor Don the fisherman. Most summers he goes off the coast of Baja, Mexico and brings back slabs of yellowtail and bluefin tuna, that he hands out for free! Now, I know this is a cheat for cheap$kate ingredients. But I made an exception and went ahead and did a sushi recipe series anyway. If you make friends with a fisherman then you're in luck. But, I have a few inexpensive shortcuts you can use. It's funny how persnickety and intimidating sushi chefs are. Chat a bit with one and they are really pleasant. As for making sushi, it's not that hard, if you just roll with it. I give you easy GIFs and illustrated photos to get you through the hard parts - believe me it's not that hard to do, and don't worry if the end result is not perfect - it will still taste good. Start with a hand roll, that's easiest to do. My favorite 2 sushi recipes from the video series are: Spicy Tuna Hand Roll and a California Roll. My wife picked up some ceramic ramekins this year so I had to make use of them. What I came up with is a luscious Baked Eggs Florentine. So good, just spinach in a cream sauce with a fresh broken egg on top. It's a handsome dish that's made to impress, but still simple to make. And I close out with the final three recipes using cheap chicken. 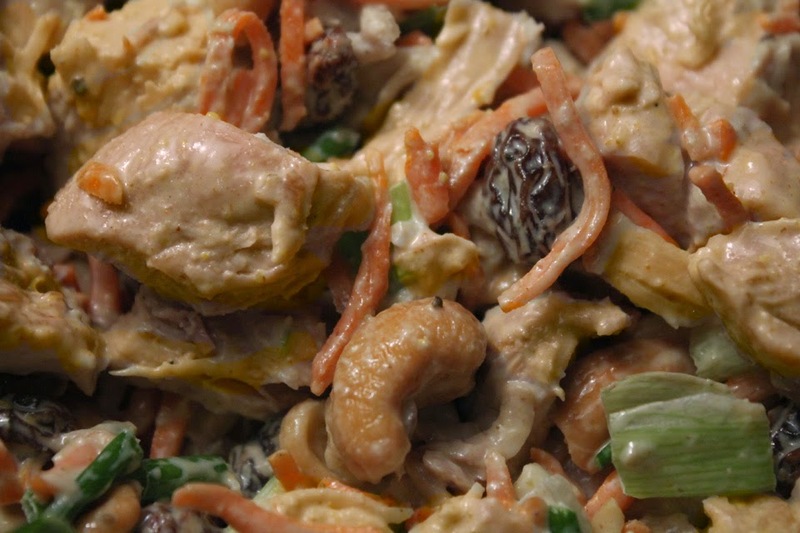 My wife loves Trader Joe's Curried White Chicken Deli Salad with cashews and raisins, and so do I. Trader Joe's is a great local market here in Los Angeles. They make a lot of prepared food to take home. There curried chicken salad is exceptional, so much so that they run out of it by the time I get off work, so that's why I made my ripoff (I mean homage) recipe. It's wife approved, so I know you will like it too. Chicken Caccaitore is a one pot meal, easy on the pocketbook and tasty, just the way I like it. Serve it with a little pasta or rice. And this year I tried my hand at Fried Chicken. Almost everyone has their own favorite recipe, well here's mine. And if you are a newbie at it, then start with this recipe. I made a Fried Chicken Sandwich recipe video that's easy to follow. I use boneless and skinless chicken, but you can use any whole chicken pieces you find on sale. I also throw in a cheap$kate Homemade Buttermilk recipe. Roasted Chicken with Peaches & Herbs is a great combination - one of my favorite recipes of the year. It's sweet with caramelized fruit and succulent roast chicken, and the herbs take it all to another level. Plus it's another one-pot meal that is so easy to assemble. Just check out my recipe video below to see how it's done. Well that's it. I had a delicious year of cooking and I hope you did too, especially if you've tried any of my Top 9 Recipes of 2014.